Hello Ribbon Retreat Peeps! I’m Heather from The Sewing Loft and it’s super exciting to be part of the Bag Lady series! Today, we are going to create this bucket bag. This bucket bag is really big and can carry pretty much everything you can imagine! That’s right, you can load this baby up and become the “bag lady” you want to be! *Basic sewing supplies and machine are needed to complete this project. Gather supplies. I used the whimsical Wildflower collection from Adornit! Start by downloading the bucket bag template. Print, cut and tape template together; overlapping where needed. Bag bottom (cut 1 of main fabric, 1 of lining and 1 of fusible fleece) use pattern template. *To add body to bag, I suggest applying a fusible fleece to main fabric before cutting. Follow instructions provided by the manufacturer. To mark gather placement on bucket sides, fold fabric to the center (bookend style fold) and mark 3″ from each side. This is your gather/basting start and stop point. Stitch two rows of large basting stitches from dot to dot. Be sure to leave long thread tails for later. Repeat this on both lining and main fabric. Set aside. Position pocket trim 1″ below top edge of pocket. Layer right sides together and stitch in place. Turn and press trim up; edge stitch with coordinating thread. Sandwich between 2 layers of pocket top edge. Straight stitch together. Open and press trim to one side of pocket. 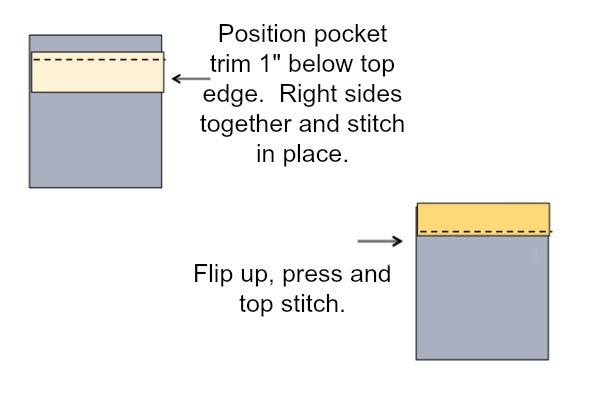 **Tip: Back stitch seam allowance to pocket lining. This will create a nice clean edge to fold back and press. Small steps like this will elevate your project from home-made to handmade. Sandwich pocket lining to pocket face; all around straight stitch leaving the bottom edge open. Press, clip corners on a 45 degree angle and turn right side out. Press again and position on front of bag. Straight stitch along pocket sides. Consider adding a dog ear triangle for reinforcement. Match the short ends of bucket bag sides; right sides together and stitch. Press seam allowance open. Consider trimming away fusible fleece to reduce bulk. Top stitching with coordinating thread. Match bag side to the bottom of bucket. Gently pull long thread tails of gathering stitch as needed to fit snuggly around curved base of bag. Pin all around and stitch in place. The process is repeated to create the lining with one exception. You will need to leave a 6″ opening along the short side of lining seam. This is to allow for turning later. Layer interfacing to the wrong side of strap. Fold in half to create a long triangle and stitch together. Turn and press seam in the center. To reduce bulk on my shoulders, I like to fold the center of straps in half and stitch. To do this, find the center and mark length. I used 10″. Fold in half and edge stitch closed. Position handles 10″ apart on center and 2″ below top edge. Straight stitch in place. Fold up and add top stitching to secure. Repeat to other side. Let’s assemble!! Slip the right side of bucket bag into the lining. (right sides will kiss) Stitch all along top edge. This is why that opening is so important in the lining! Back stitch your seam allowance to the lining side of bag. Turn right side out and press. *Remember, pressing is super important! Pin straps in place and top stitch along top edge in coordinating color thread. Stitch up your lining and add a few hand tacking stitches along the bottom of bag to secure lining. Phew, we’re done!! Well, I hope I didn’t overload you with photos and this bucket bag inspires you to get your needle moving! Don’t be shy, be sure to stop by to say hello. I have a ton of scrap fabric stash busting projects and sewing tips. A big thank you to The Ribbon Retreat for inviting me to be part of the Bag Lady Series. I love this big and spacious bag! It is such a great…go anywhere bag. It would be perfect for holding towels for swimming lessons, library books for those anticipated library trips, or snacks galore and activity books for those long road trips. Whatever the occasion, this bucket bag would be fitting and flat perfect! Don’t forget to enter our Bag Lady Giveaway and to link up any bags you have made. If you don’t have a blog…no worries, you can use Photobucket, Fickr, or feel free to email them to me at michelle@theribbonretreat.com. Five bags that are linked up will win a special prize! Hurry fast…the giveaway ends tonight! Now that we have celebrated boys with our Oh Boy! Series and bags with this Bag Lady Series…let’s celebrate what created our fantastic and FABulous company….RIBBON! Starting Monday, we are going to have a ribbon attack and see how many projects we can come up with using ribbon. We have hair bows, banners, ribbon skirts, ribbon wands, and so many more fun and innovative projects to share. See you then! Happy Creating & Happy Bag Ladies! This entry was posted in Bags, Bags, Bags. Bookmark the permalink. Trackbacks are closed, but you can post a comment. Sew perfect! Our school’s huge annual fundraising auction is coming up and our class was assigned a beach-themed basket to auction. This is the perfect size/shape to make in some outdoor-weight fabric for a beach bag. Thanks so much! Beautifully designed. I like the way it stitched. This is a kind of perfect beach bags. I love the look and size of this bag – I hate little bags, because I never can find or fit everything I need in them! Quick question: what is the actual finished size of this? Perhaps I could scale it down a bit for an everyday bag (I have two small children and need tons of things for them!) 😉 Thanks!